You know what I can't stand? [Uh oh, I feel a rant coming on.] I see so many delicious looking entrees on Pinterest or in cookbooks that I want to make, but then I feel a little bugged that I have to think of a green vegetable side dish that will pair well with it. I try really hard to always include some sort of green veggie with our meals and I really prefer something that "stands on its own" rather than trying to hide spinach in some sort of concoction. I think it's important for kids to learn how to eat their vegetables, and that they can taste amazing! That's why I made this Sweet + Sour Chicken with Sesame Green Beans. Louisa devoured the green beans and I couldn't shovel them in fast enough! The other best thing about this meal is that it's in one pan (technically, a wok), except for the side of rice (I used Jasmine). And really, how easy is it to throw some rice in a rice cooker? I think you and your family will love this! Combine sauce ingredients in a bowl and whisk until well combined. Set aside. In a medium bowl, whisk the eggs and season with salt and pepper. In another bowl, add the cornstarch and set aside. In a large wok (this is what I have and it has served me faithfully for over 8 years - I love it! ), heat the oil over medium high heat. Dip each piece of chicken in the egg and then the cornstarch, shaking off excess, and then set carefully into hot oil. Fry each piece (you may need to do this in a couple of batches), turning once when golden brown, until cooked through, about 7 minutes. Remove chicken from wok and drain on paper towel. Drain wok of excess oil but don't clean. Reheat wok over medium high heat (don't clean it) and add green beans, sesame oil and soy sauce. Stir and cover with lid. Cook until al dente/crisp tender (about 5 minutes), stirring occasionally. Remove beans from wok and garnish with sesame seeds. Don't clean pan. Add sauce to the wok and bring to a boil. Cook, stirring continuously, for 1 minute until the sauce starts to reduce. Add chicken and stir to coat with sauce. Make a cornstarch slurry, by mixing 1 teaspoon cornstarch with 1 teaspoon cold water, and add it to the sauce to thicken. 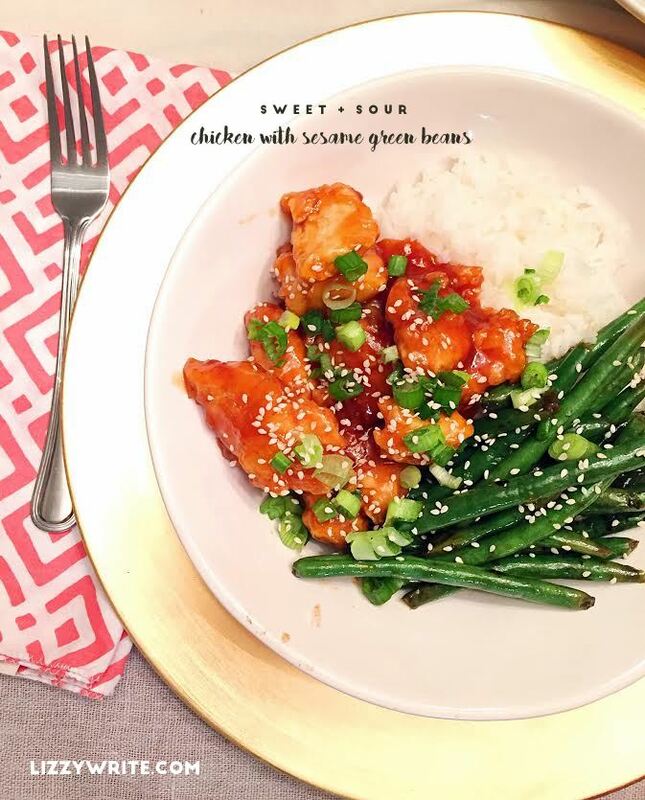 Serve chicken over rice with green beans, sliced green onions and garnished with sesame seeds. Thanks Missy! It was really good! I'm not the best Asian cuisine maker, so I was pleasantly surprised with how well this worked out! I think I might try this tonight. Do you think broccoli would work too? Definitely! I do a similar thing with broccoli. You know, I don't often think of using ketchup as an ingredient, but it is just tomato sauce, sugar, and vinegar, which are staples of American stir fry sauces. Also, your food always looks so pretty. You must have beautiful light in your kitchen. It's true! Ketchup is kind of miracle sauce - at least my kids think so. :) And thanks. The light is not great in the winter at dinner time but filters and increasing brightness on my phone makes a big difference. Ha! We had this tonight for dinner! It was so good!!! Can you go ahead and make a cookbook? At least an ebook? Thanks! !